Parador "- more stars, sharper stars, more time to observe. An optical chain is as good as its weakest link. With the development of 82 degree Nagler and 100+ degree Ethos eyepieces, Tele Vue offers the largest, flattest and best corrected visual fields in the industry. Combine the Nagler/Ethos revolution, Dobsonian revolution and Paracorr for the ideal mating for spectacular wide and sharp "spacewalk" observing. Coma makes stars look like blurry comets whose tails point out radially from the center of the field. The faster your scope's speed, the worse the effect. All parabolic mirrors used in Newtonian reflecting telescopes are limited in field sharpness due to coma. Even a perfectly made 13" f/4.5 parabola has only about 0.1 degree diffraction limited field. Previous attempts to correct for coma have been limited in usefulness. Some correctors were designed mainly for astrophotography, some required difficult installation in the focuser's draw tube. Dedicated coma correcting eyepieces were another approach. However, these were limited to 50 degree apparent fields and would orphan your existing eyepiece collection. Paracorr is a universal corrector that tightens and intensifies star images on all f-ratios down to f/3! (see spot size graphs: PDF or JPG) without adding any false color or spherical aberration! You no longer have to constantly shift a Dobsonian to keep objects centered for sharp viewing. Using a Tele Vue eyepiece, put M-13 at the edge of the field and enjoy fully resolving its beauty as it drifts across your view. Paracorr is easy to use. It slips into your focuser, just like a Barlow. To minimize focuser in-travel, due to additional length, a mild 15% Barlow effect was designed into Paracorr to effectively push the focus out. 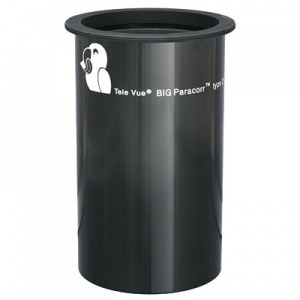 Paracorr is recommended for use with all Tele Vue eyepieces because our PlÇôssls, Radians, Panoptics, Naglers, Ethos and Delos eyepieces achieve higher levels of aberration correction than competitive models. However, Paracorr is also compatible with other eyepiece makes. Try Paracorr on your "DobNewt." We think you'll agree that the revolution is complete. Paracorr can be used with both 2" and 1.25" eyepieces. For visual use, slip Paracorr Type-2 into your focuser like a Barlow lens, and your eyepiece into Paracorr. (3" BIG Paracorr Type-2 requires adapter and tunable top for visual use). 1.25" eyepieces will make use of Paracorr's special low profile 1.25" reducing adapter. Paracorr is threaded for 2" filters. Note: The Paracorr Type 2 optical assembly is also available in a special adapter housing made by Starlight Instruments for their Feather Touch focusers. This unit avoids the need for a tunable top to optimize eyepiece position. Some Dobsonian manufacturers may also offer the Feather Touch focuser with integrated Paracorr type 2 as standard. Starlight Instruments offers Paracorr Type 2 integrated with Feather Touch focuser or as an add-on if you already have a Feather Touch focuser. Paracorr also works with DSLR and CCD cameras. Just unscrew the lens assembly from the Tunable Top and attach appropriate threaded accessory tubes and camera mounts. As you've read, all Newtonian / Dobsonian telescopes can benefit from using a Tele Vue Paracorr (Parabola Corrector) to eliminate coma in the image. One aspect to optimizing this correction is the distance of the eyepieces focus point (field stop location) to the last surface of the Paracorr lens (within a small +/- tolerance of course). Typical eyepieces used with fast Newtonians can have field stop locations differing by as much as half an inch. To accommodate for the differences, we developed the "Tunable Top." The "Tunable Top" permits optimized aberration control for all Tele Vue eyepieces and many others, by simply loosening a screw and rotating the Tunable Top. The eyepiece barrel height raises and lowers, allowing you to maintain the proper field stop to Paracorr lens distance. eyepieces accepted 2" or 1.25"